A hilarious book about Skunk, who is trying to help the Easter Bunny dye eggs for Easter. But every time Skunk gets excited about Easter he…..well…..emits a rather unpleasant odor. Eeww! Kids and parents both got plenty of giggles out of this one! This book is made to be read aloud. This is the way he flops his ears. (flop hands above head like ears) …..etc. This is the way he shakes his tail. (shake bottoms) …….etc. One little bunny hopped away…..
No little bunnies went out to play. They’re all getting ready for Easter day! Hippity hippity hop, HAY HAY! The words for this rhyme are from Loons and Quines @ Librarytime (originally from a book of the same title by Opal Dunn.) I did change the words in the last stanza to make it Easter-themed. Choose five pieces felt in spring colors. Cut one bunny from each color, about 1/4 inch larger than the original template. Cut five small circles from pink felt for the noses, and small pink shapes for the inside of the ears. Make five pom-pom tails, using white or cream yarn and following the instructions from the Purl Bee. Glue each white bunny onto a colored bunny. Glue on the pink inside-ear pieces and the pom-pom tails. Draw on black eyes using a permanent marker. We pulled apart pieces of string to make the thin whiskers. Glue the whiskers on, and then glue the nose on top of the ends to hold them in place. 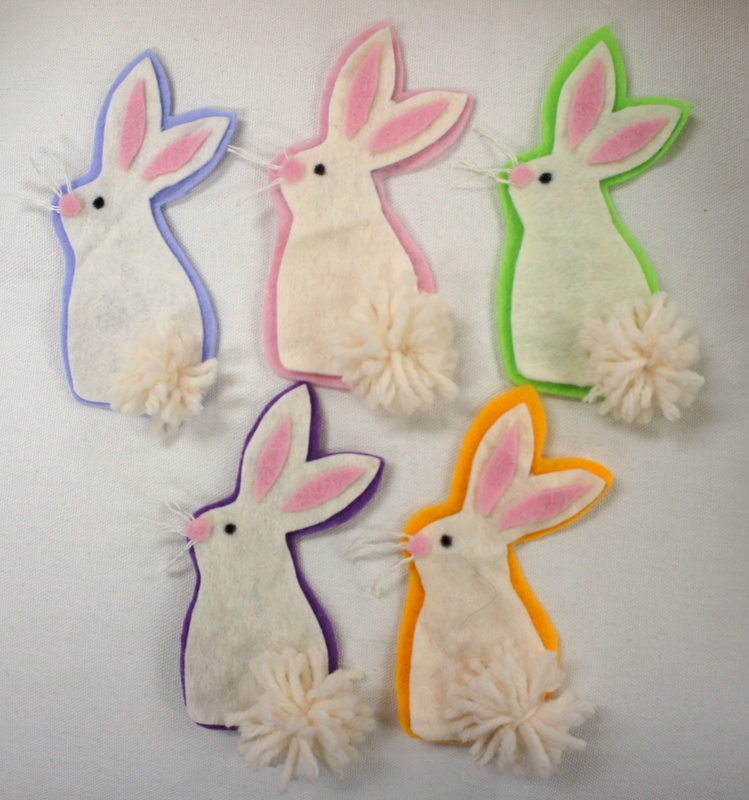 Attach Velcro to the backs of the bunnies; their tails make them too heavy to stay on a flannel board themselves. Chester chooses the colors of the rainbow to dye his Easter eggs. Once they are finished, he gives them out to his friends. A cute book about friendship that is also helpful for practicing colors. We photocopied the eggs from the pages of the book and cut them out to make the accompanying flannel board. As I read each page, I placed the corresponding egg on the flannel to make a rainbow at the end. ACTION SONG: If You’re Hoppy and You Know It! This craft idea and instructions are from Kaboose. For the icing I used 2 cups confectioner’s sugar, 3 tablespoons butter, and 2-3 tablespoons boiling water (Beat all ingredients until fluffy.) 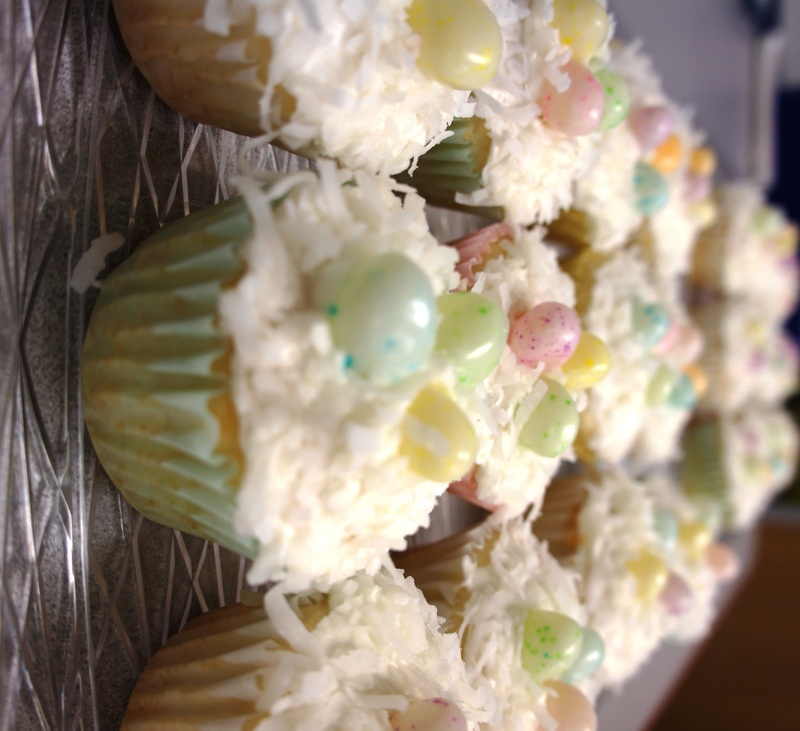 After the cupcakes were iced, I dipped them in shredded coconut and topped them with speckled jelly beans. March 21, 2013 in Spring, Toddler Storytimes. Leah, I can’t thank you enough for taking the time to post all of your wonderful ideas. Please keep up the great work! Ooh, I love the bunnies and all your other Easter ideas. I’m glad you found a use for the Hipperty Hop rhyme and I like what you did with the last verse to make it more Easter-y. 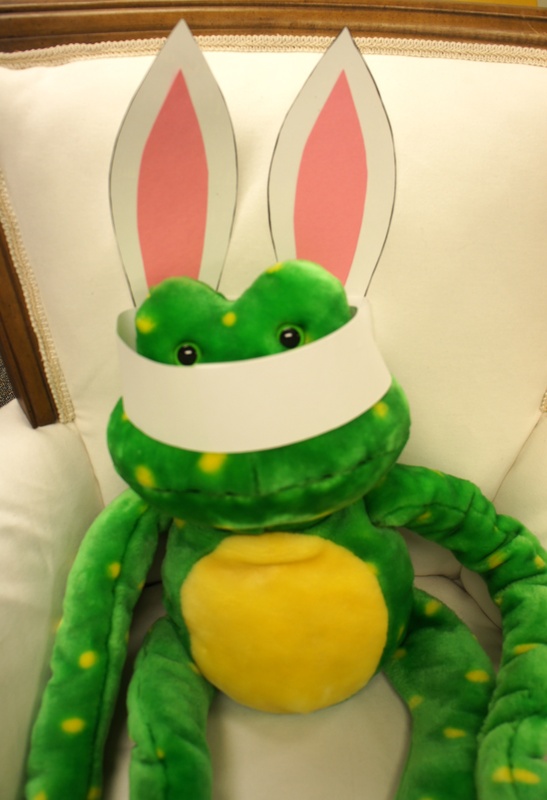 Thank YOU for posting the hippity-hop rhyme! I was excited that it’s not just another “five little bunnies…” rhyme. We loved using it in storytime!